India slipping from 136 to 138 in the 2018 World Press Freedom Index is an illustration of increasing violence against journalists. Gauri Lankesh’s murder and the increase in online threats using the same as an example adds another variable to the equation complicating the situation of freedom of press in India. The blatant and outrageous way in which Gauri’s murder is worn as a badge of honour by Hindu Nationalists exhibit the surreal implicit legitimacy they believe to have acquired due to the lack of strong political backlash. The continuous encroachment and exploitation of journalists in Kashmir is another example of the state authorities acting to promote an ideological agenda that the central government tacitly approves of. Although there are always dominant ideas prevalent in the society, the problem with the current situation is not the existence of pro-nationalist ideology but the alarmingly insecurity in weighing a different opinion. There are always different sides of a story and the increased number of attacks and the curtailment of freedom of press will only ensure that the Indian society becomes less and less tolerant. Committee Against Assault on Journalists (CAAJ) has compiled a book on various cases related to assault on journalists from primary and secondary sources. 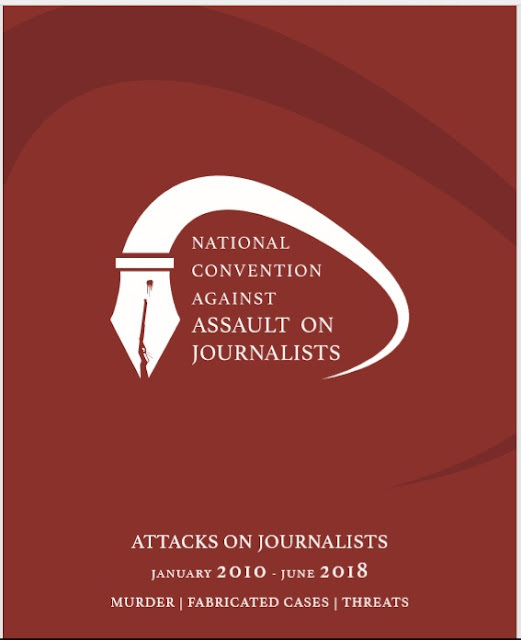 On the eve of National Convention Against Assault on Journalists to be held in the Constitution Club of India on September 22-23, CAAJ is releasing the PDF version of around 200 cases related to killings, threats and fabricated cases against journalists all over India from January 2010 to June 2018. This booklet can be downloaded from the google drive link by clicking on the cover below. The booklet will be available in print format during registration on September 22nd at the venue.